Energy Independent Solutions is trusted by hundreds of Residences, Businesses, Farms and Municipal Buildings throughout Pittsburgh, Western Pennsylvania and beyond. We are a local Pittsburgh company with a track record of high-quality solar installations, solar service and the best solar field performance rating in the industry. With EIS, you will receive an in-depth solar energy education, assessment and recommendation for a great return on your investment. 1 The solar panels convert sunlight into DC electricity, the same energy you use in your flashlight or cellphone. 2 This energy is then converted to AC electricity by an inverter. It is identical to the energy powering your lights and TV in your home today. 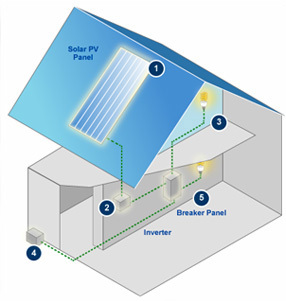 3 As your home uses power it takes it first from the solar array. You don't need to flip any switches, it happens silently and seamlessly. You will not know if you are using solar or the current power grid. 4 During times when your array is producing excess energy, your meter with turn backwards and push this energy out onto the grid for storage. When night comes and you need the energy again, your home will simply pull the energy right back off of the grid. The utility company does not charge you for this service and will pay you for any excess energy you generate. 5 Our panels produce energy under nearly any conditions. In the rain and under snow, there has never been a day where our arrays have not produced energy.